Lower wage jobs are gaining in the employment market while higher paying jobs lost during the recession have yet to return. The challenges of workers laid off during this period that find and settle for these lower paying jobs was highlighted in a new report released by the U.S. Conference of Mayors (USCM). The mid-August report was released in conjunction with the inaugural meeting of the USCM Cities of Opportunity Task Force in New York City. The annual wage in sectors where jobs were lost during the downturn was $61,637, but new jobs gained through the second quarter of 2014 showed average wages of only $47,171. This wage gap represents $93 billion in lost wages. 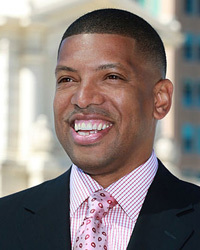 “While the economy is picking up steam, income inequality and wage gaps are an alarming trend that must be addressed,” said U.S. Conference of Mayors President Sacramento Mayor Kevin Johnson. “This Task Force, led by New York City Mayor Bill de Blasio, will recommend both national and local policies that will help to give everyone opportunity. We cannot put our heads in the sand on these issues,” he said. The report also shows the gap between low and higher income-households is growing and will continue into the foreseeable future. In 2012, the latest year for which figures are available, 261 (73 percent) out of 357 metro cities had a larger share of poorer households (those making less than $35,000 per year), than upper income households of above $75,000. “The nation’s mayors have an obligation to do what we can to address issues of inequality in this country while Washington languishes in dysfunction,” said Mayor Johnson. Under a similar analysis conducted by the Conference of Mayors during the 2001-2002 recession, the wage gap was only 12 percent compared to the current 23 percent—meaning the wage gap has nearly doubled from one recession to the next. The report is Mark Wilson’s life in words. Mr. Wilson was laid off in 2010. It was two years before he could find employment. “When I finally did get another job it was a $15,000 pay cut. It was a bitter pill to swallow but I was just glad to be employed. Finding a new job can be very hard. The resume game is difficult to crack. I’ve got two degrees and it was so stressful to get a job,” he told The Final Call. 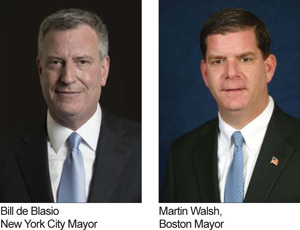 New York City Mayor Bill de Blasio and Boston Mayor Martin Walsh lead the Task Force responsible for the report. It was established at the Conference’s Annual Meeting in June to identify strategies for addressing income inequality, promoting economic mobility and creating jobs in America’s cities. “The inequality crisis facing our cities is a threat to our fundamental American values. Reducing income inequality and ensuring opportunity for all is nothing less than the challenge of our times. As mayors, we are on the front lines and we must act now,” said Mayor de Blasio who is also Chair of the Mayors’ Cities of Opportunity Task Force. The report forecasts that middle-income households will continue to fall behind as higher income levels capture a greater share of income gains. The report concludes that income inequality will continue to persist in the coming years, as it is a structural feature of the 21st Century economy. “Unless policies are developed to mitigate these trends, income inequality will only grow larger in the future,” according to Jim Diffley, director of U.S. Regional Economics at IHS and author of the report.